The ceiling is one of the largest unbroken expanses seen in any room of your home. It can be plastered, aggregate, vaulted, dropped or tiled for aesthetic or functional reasons. If you're considering what to do with your ceiling, don't overlook the many types of ceiling tiles available on the market. 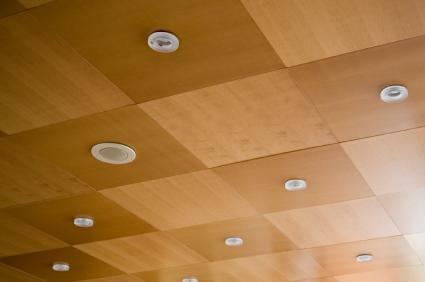 There are four broad types of ceiling tiles - acoustical, plastic, tin and cork. Within those categories there is a further break down of tiles by design, installation and use. Acoustical ceiling tiles are used to help soundproof a room. They are usually made of fiberglass, and are installed using a drop-ceiling method. This means that metal strapping is installed across the ceiling and the tiles are dropped or hung from the straps, although some brands do make tiles that can snap together without visible straps. Acoustical ceiling panels usually need to be installed by a professional to ensure their acoustical and insulating properties, but some brands can be put up by an experienced DIYer. Acoustical ceiling tiles are often also used for insulation because the same materials that make them soundproof also insulate the room thermally. Depending on their makeup, they can help to lower the heating and cooling costs of the room in which they are installed. These tiles are usually sold by the box, with the amount needed to cover a typical room of the house running about $500. Armstrong makes commercial and residential panels in a variety of colors, shapes and sizes for acoustical and insulating purposes. Their tiles can be dropped- in, or they can be installed using Armstrong's snap-lock system, which uses metal clips to lock the tiles together without visible brackets. CertainTeed makes environmentally friendly acoustical ceiling tiles in different colors, thicknesses and shapes. Their tiles are ready to order and ship quickly, so you can get your project done soon. Plastic ceiling tiles are a lightweight and inexpensive alternative to traditional tin ceiling tiles. The plastic tiles come embossed in a number of different patterns including flowers, wreaths and repeating designs. They can also be used to give a geometric, three-dimensional appearance to the ceiling. These tiles are extremely easy to install for a DIYer. They can be dropped in or nailed up, and you don't need to worry about denting or dinging the tiles. They can be painted in the same finishes a tin ceiling is often displayed in. The biggest pro for plastic ceiling tiles is their cost; they typically run between $1 and $10 a panel, making them very cost effective. WishIHadThat sells plastic ceiling tiles in direct-mount and drop-in styles. They specialize in three-dimensional tiles, which can give your ceiling the expensive look of metal or plaster ceilings, but in an easy to use and less expensive style. 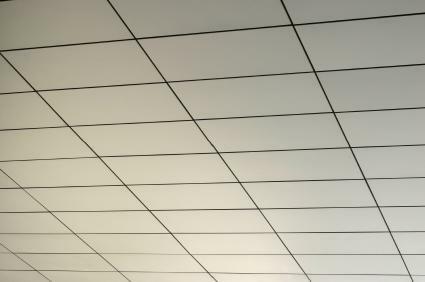 Ceiling Tiles By Us makes plastic ceiling tiles that look like tin ceilings. They are easy to install for DIY homeowners, and can be put up in less than a day to cover the entire ceiling. True tin ceiling tiles are a beautiful addition to any home. Contrary to what the name implies, most tin ceiling tiles today are made of aluminum, copper or brass. They are usually installed by nailing them up and overlapping the edges of each panel with the next, although they can be dropped-in as well. Their designs are usually repetitive, with scrolls, flowers, vines and geometric patterns being popular. Tin ceiling tiles are a little more difficult to install than plastic, but can still be put up by most homeowners. If you nick or dent a panel, it can be repaired using auto body repair compound and some sculpting. 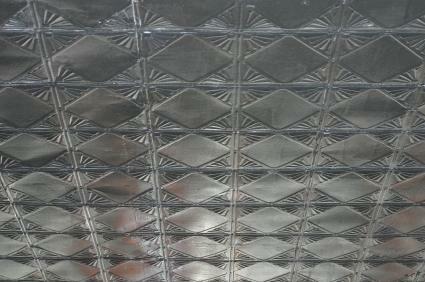 Tin ceiling tiles are more expensive than their plastic look-a-likes, running about $15 to $40 a panel. 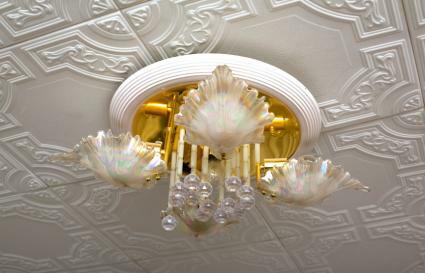 The American Tin Ceiling Company sells tin ceilings in every pattern and color available. There panels can be installed in two different methods, drop-in and snap-up, which allows you to snap and screw the tiles to the ceiling without brackets or braces. Brian Greer's Tin Ceilings are high-quality ceiling panels made of thick sheets of metal. These panels are harder to install, but are less likely to become damaged. The quality of these tiles sets them apart from thinner, pressed tiles. Cork ceiling tiles are an eco-friendly ceiling tile that can also insulate your home. Cork is naturally fire and water resistant, as well as sound absorbing, which makes them a great all-around ceiling tile for many homes. 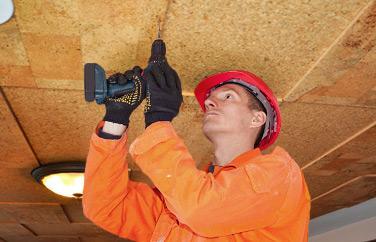 Cork ceiling tiles can be dropped-in or installed using adhesives. They can also be overlapped and installed in decorative patterns and designs. Some experienced homeowners may find them easy to work with, but most homeowners may prefer to have this type of tile installed by professionals. Cork ceiling tiles are mid-range priced, running about $5 a tile. Jelinek Cork Group makes several different types of cork tiles that are suitable for ceiling installation. They also show you how to layer the tiles for varied and architectural looks. LeeCork makes two different types of cork tiles that are suitable for ceiling installation. They help you make the right selection for your home based on installation methods and style. A new ceiling can transform the look and feel of any room of your home. Whether you want new ceiling tiles for insulation or decorative purposes, they are sure to be a wonderful addition to your home.